Taking into account the extent of federal fiscal retrenchment, the Committee sees the improvement in economic activity and labor market conditions since it began its asset purchase program a year ago as consistent with growing underlying strength in the broader economy. However, the Committee decided to await more evidence that progress will be sustained before adjusting the pace of its purchases. Accordingly, the Committee decided to continue purchasing additional agency mortgage-backed securities at a pace of $40 billion per month and longer-term Treasury securities at a pace of $45 billion per month. This means that the monetary base, or base money, will continue to expand by about USD85 billion monthly going forward until the Fed decides to taper. Tapering will create many problems (e.g. see here and here) and with the Fed being the marginal buyer of treasuries and agency MBSs, it remains difficult to see how the Fed can start tapering at all. Please note that this is grounded on the Fed's view of economics that central bank intervention and low interest rates help an economy "grow". Therefore, any tapering decided on, certainly initially, is likely to be very modest in my opinion. The money creation process in a fractional reserve bank system such as in the US is in broad terms a two step process: firstly, the Fed largely controls the maximum amount of money that can be created for the banking system as a whole through its control of the total amount of reserves in the banking system. 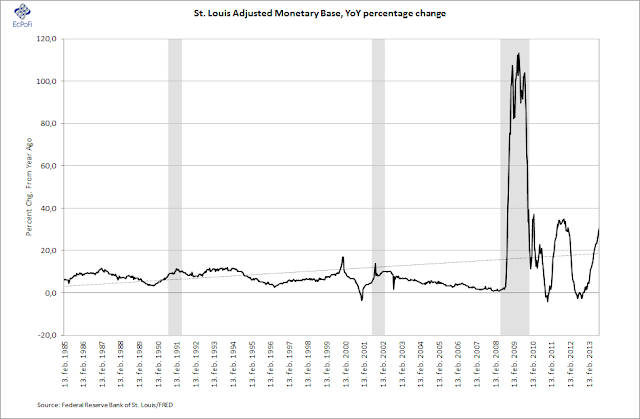 Secondly, the banks decide how to put to use any excess reserves it might have either through parking them at the Fed (currently earning interest of 0.25% p.a. 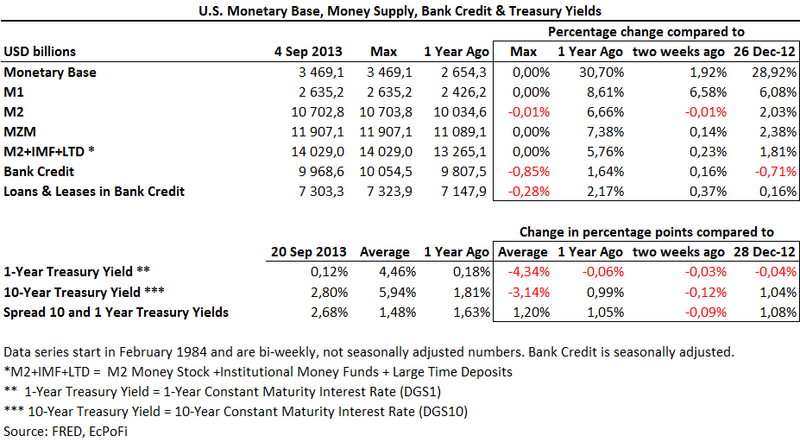 ), investing them, pay dividends or lending them out. Post Lehman, banks have largely chosen the former, i.e. parking excess reserves at the Fed. This means that most of the money created remains within the banking system itself rather than having spread out in the real economy, i.e. it has become part of the monetary base (which consists of bank reserves and currency), but not the broader measures of money supply (e.g. M2). 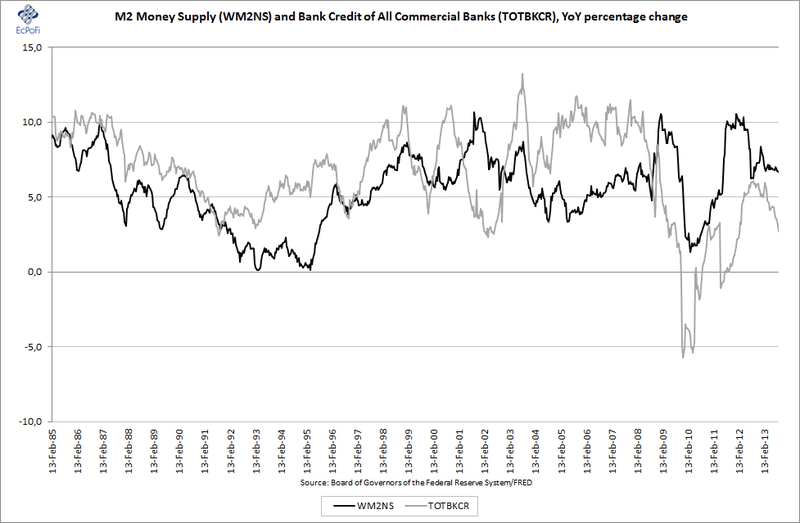 This is one reason we monitor both the base and the broader measures of money supply in this report. 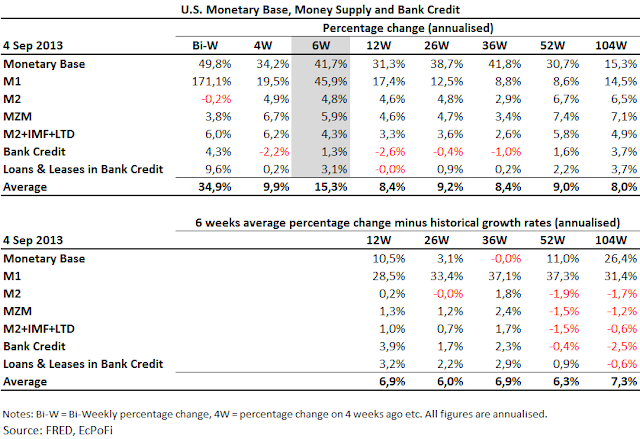 As the Fed continued buying assets at a pace of about USD$85 billion a month, the monetary base continued to increase, increasing 1.9% on two weeks ago. This year alone it has increased by 28.9% and compared to one year ago it is up by 30.7%. The monetary base is currently at USD 3.4691 trillion, USD 2.5934 trillion, or 296.2%, higher than the week before the Lehman collapse (week ending 10 September 2008). 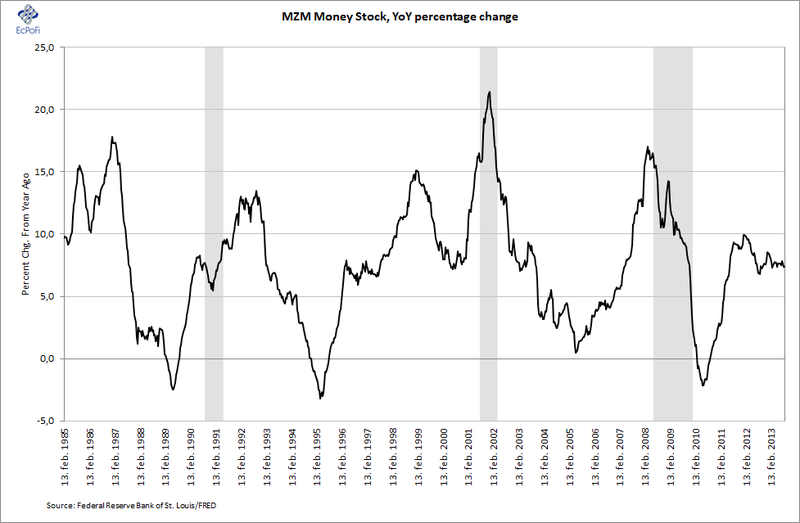 All the broader measures of money supply continue to grow on both a shorter- and a longer-term basis. The M1 money supply growth on same period last year (YoY) increased from 8.3% two weeks ago to 8.6% this week as it jumped 6.6% (171.1% annualised) during the last two weeks. 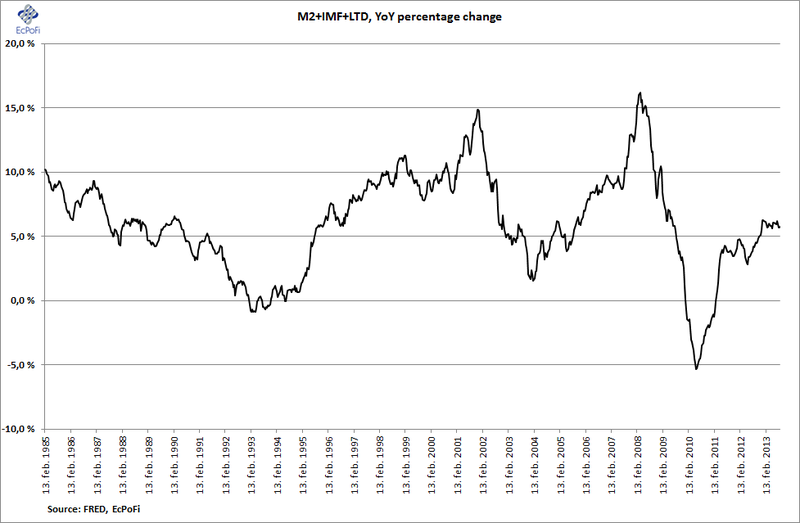 It remains however significantly below the average YoY growth rate of 15.1% last year and 15.2% in 2011. 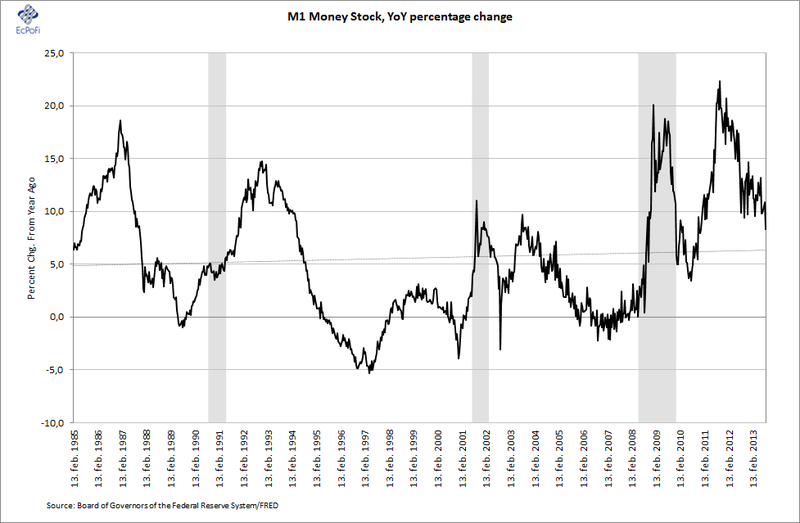 The M2 money supply YoY growth rate has been fairly stable in the 6.7% to 7.2% range since February. 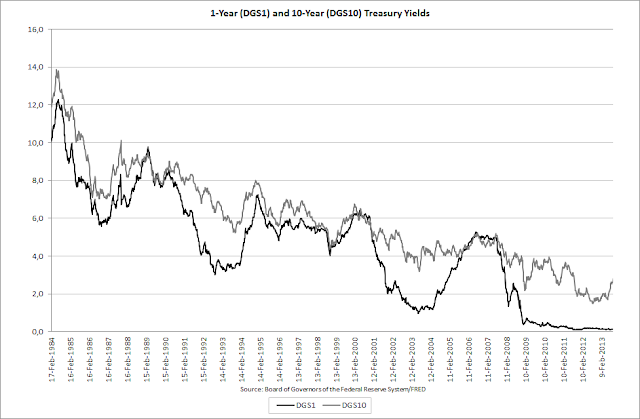 The shorter term growth rates are however for the most part lower than the longer term growth rates pointing to a general slowing down in the overall growth rate. For example, the annualised growth rate during the last six weeks of 4.8% is 1.9 percentage point lower than the growth rate during the last 52 weeks and 1.7% lower than the 104 week average. Also, the average YoY growth rate in 2013 is the lowest it's been since 2010. The broadest measure of the money supply, the M2+IMF+LTD* continues to grow at the fastest pace for about four years, but it has remained fairly stable since February. 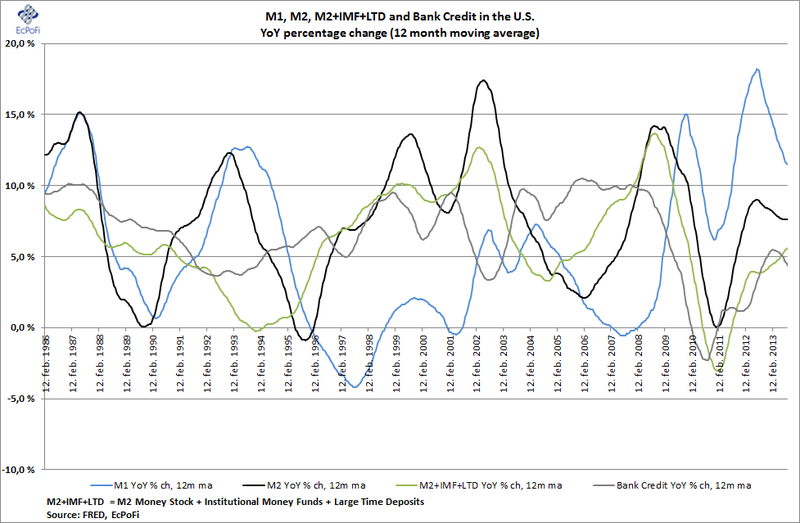 The considerable drop in the growth rate in Bank Credit since around May and especially in recent weeks has partly been the result of a decline in the total amount securities, of which treasuries and MBSs make up about 66.5% these days (see here for details). Part of the reduction in the growth rate in Bank Credit is therefore likely the result of rising interest rates and their negative effect on banks' available-for-sale securities (e.g. see here). Starting this week "Loans & Leases in Bank Credit" will hence be included in this report as well to get a more detailed look at developments in banks' loan portfolios. 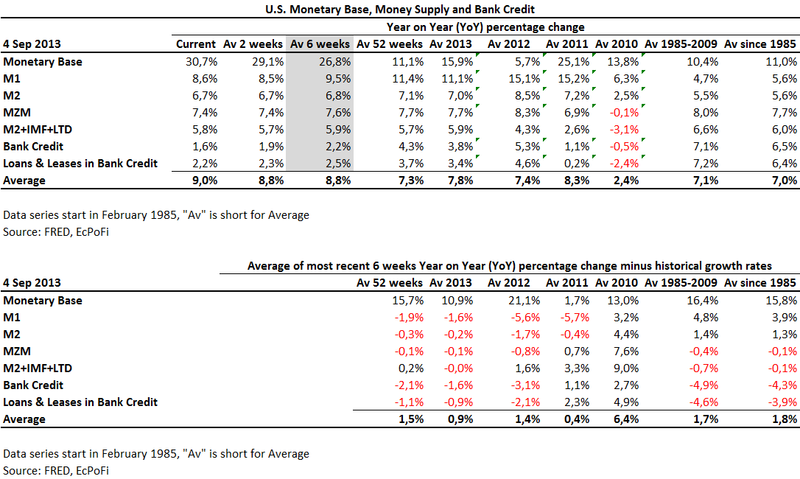 Year to date, Bank Credit is 0.71% lower than it was at the end of last year. 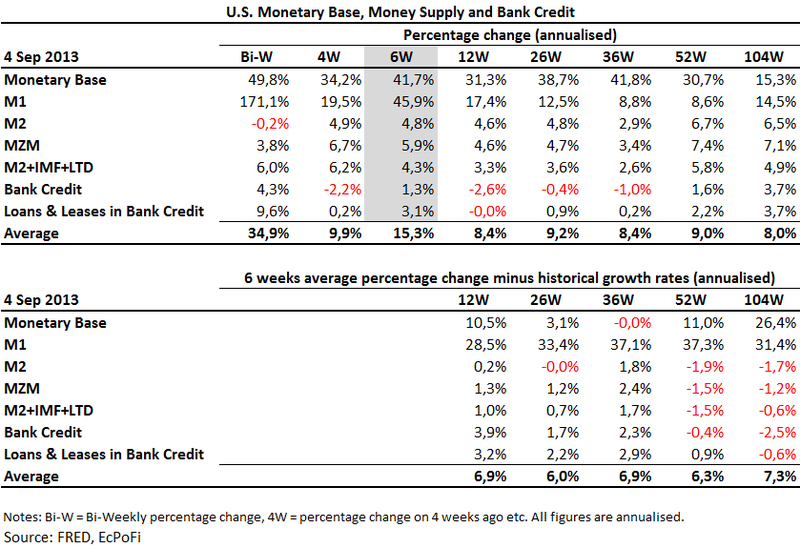 Though Bank Credit increased 0.16% (4.3% annualised) on two weeks ago, it has dropped during the last 12, 26 and 36 weeks. Furthermore, the YoY growth rate fell again during the most recent week and at 1.6% was the lowest reported since week ending 2 November 2011. As the new chart below shows, the YoY growth rate in Loans & Leases in Bank Credit has consistently dropped since hitting 5.7% in the middle of June last year. At 2.2%, the current growth rate is the lowest reported since the middle of December 2011 and at the same time it has expanded only fractionally (0.16%) since the end of last year. 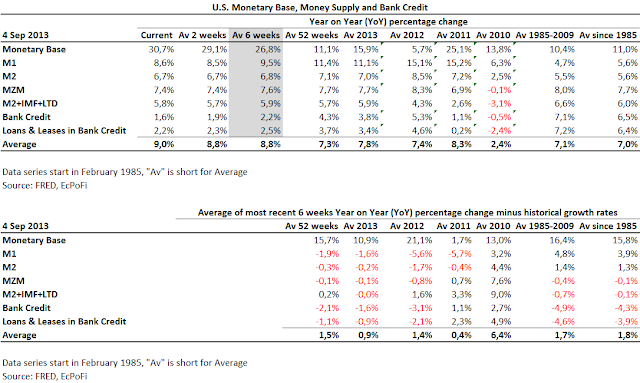 The average YoY growth rate during the most recent six weeks of 2.5% is the lowest since 2011. 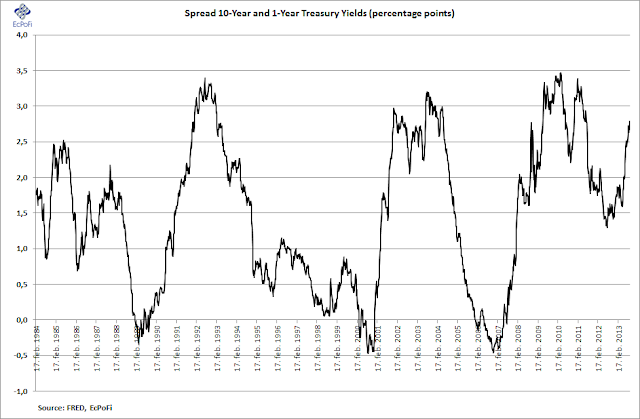 Treasury yields declined on two weeks ago due to the Fed's decision not to taper its asset purchases at this stage. 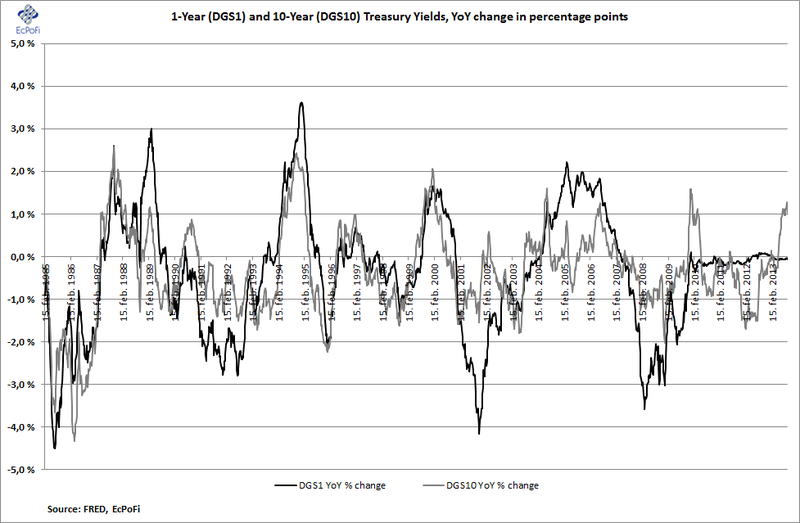 The 1-year treasury yield is now 4 basis points lower than at the end of last year while the 10-year yield is 104 basis points higher.